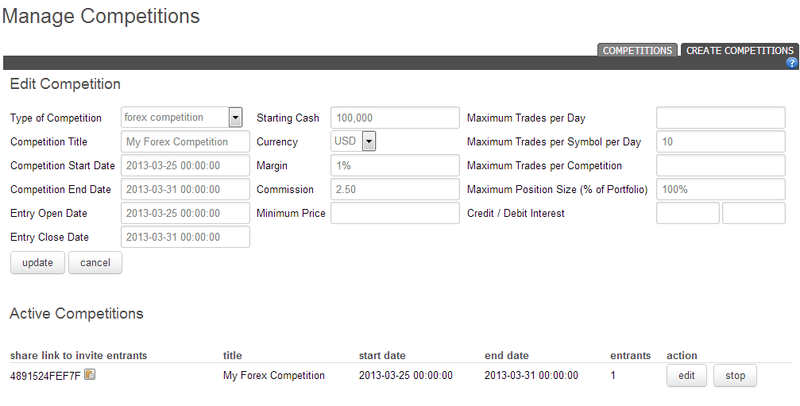 Forex and Share Trading Trading Contests can be created for up to 20 entrants. 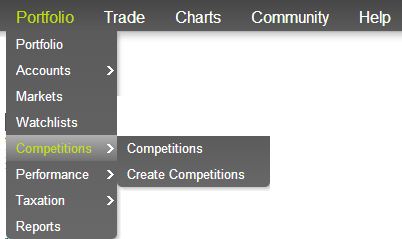 The 'Create Competition' tab displays Active and Paused Competitions. Only 'Active' competitions are displayed on the competition entry screen. Short Shares: enables or disables the shorting in share competitions. If creating trading competitions using delayed US data, then it is recommended that the 'Maximum Trades per Symbol per Day' is restricted to one. Please note that a competition has to be stopped first before it can be deleted. To delete a stopped competition, click on the check box beside the stopped competition, then click on the 'deleted selected competitions' button. Splits and consolidations are automatically added to competitions, however it can take a period of time for the information to become available on the price feed. In addition the price feed does not always have the information for some markets. If there is a share reorganisation event for a competition symbol, please contact us to have the competition transactions updated. Should you contact us, please specific the symbol that had the share reorganisation.